It was a cold, breezy afternoon in Atchison, Kansas, but to the Benedictine College students gathered in the Haverty Circle to await Abbot James' send off blessing the bitter weather was an afterthought. There was a contagious joy and excitement emanating from the students as they prepared for the long journey that awaited them. In just a couple days they would be given the opportunity to be a witness to life and hope on a national stage, and they would not be alone. Joining the students were Fr. Simon and Br. Placidus from St. Benedict's Abbey. Both had almost parental roles, with Br. Placidus acting as a chaperone for Maur Hill Mount Academy and Fr. Simon offering the spiritual needs as the chaplain for Benedictine College. The fleet of six buses embarked from Atchison on January 25 and drove through the night, arriving in Washington D.C. later the next day. The first stop was Holy Trinity Catholic Church, a historic parish near Georgetown University. There the students were not only rejuvenated physically, after spending long hours crammed in buses, but also spiritually, with the celebration of the Mass. Fr. Simon’s homily, which focused on the Gospel passage “for there is nothing hidden except to be made visible; nothing secret except to come to light” (Mk 4:22), was especially meaningful. He described how many people who have experienced the March for Life will say that their favorite part was seeing the women and the former abortion workers with the t-shirts and signs that say “I regret my abortion”. Seeing these people who are unashamed to “bring their own sin into the light are some of the most moving moments”, Fr. Simon said. Their presence at the March truly manifests the power of conversion and is a witness to all of us of God’s forgiveness and the need to respect life. 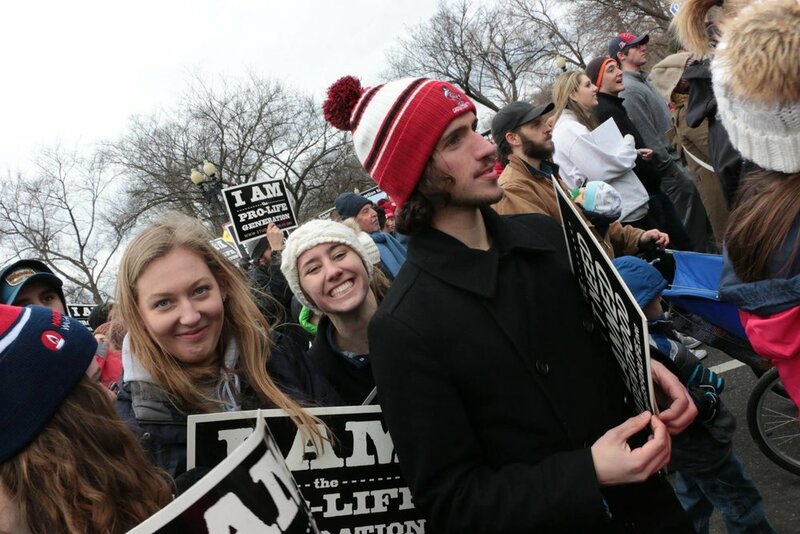 On Friday, January 27, the students and monks joined hundreds of thousands of other Americans on the National Mall for the rally that preceded the March for Life. With the promise of the attendance of Vice President Mike Pence, there was a new kind of legitimacy that seemed to be stamped on the atmosphere at the rally. Security guards channeled thousands of people through airport-like terminals, police officers on horseback roamed the grounds in droves, and armed guards were even positioned on the top of nearby buildings to survey the mall for suspects. All these extreme measures were reminders of one undeniable truth, that is, that for the first time the Vice President of the United States was going to speak at the March for Life. Fr. Simon noted that Mr. Pence's wife, in introducing him, mentioned that the weather was the best that it has ever been for the March. “Clearly this woman has been coming to the March for Life for a long time”, Fr. Simon pointed out. In his wife’s introduction and in his own words during his speech, Mike Pence proved that he is not just pro-life for political reasons. Rather than focusing on what divides the country, he spoke of showing love and creating a nation for every American, including women and unborn children. “Compassion is overcoming convenience and love is defeating despair” he said. “In a word, life is winning in America because of all of you”. The March itself was simply a continuation of this hopeful and joyful atmosphere. Mixed in with the tight crowds of pro-lifers from around the country were the Benedictine students and monks, united under their large, black banner and drum corps. Raising their voices above the din of the drumline, they joined thousands of other young people chanting, “We are the pro-life generation”. Yet the March was a far cry from the riotous atmosphere that distinguishes many other types of protests around the country. At the completion of the March in front of the imposing Supreme Court building, the Benedictine group paused to pray the rosary. It was a telling symbol of the fact that conversion and transformation comes not from ourselves, but from God. Because of this, prayer is not meant to end at the March. “You can’t convince people to be pro-life, people have all kinds of reasons to believe what they do…but the Lord can, the Holy Spirit can convince someone of the truth, that’s His job”, Fr. Simon pointed out. “So we love and we pray”. Also Fr. Simon indicated that the March for Life is about more than the unborn babies. 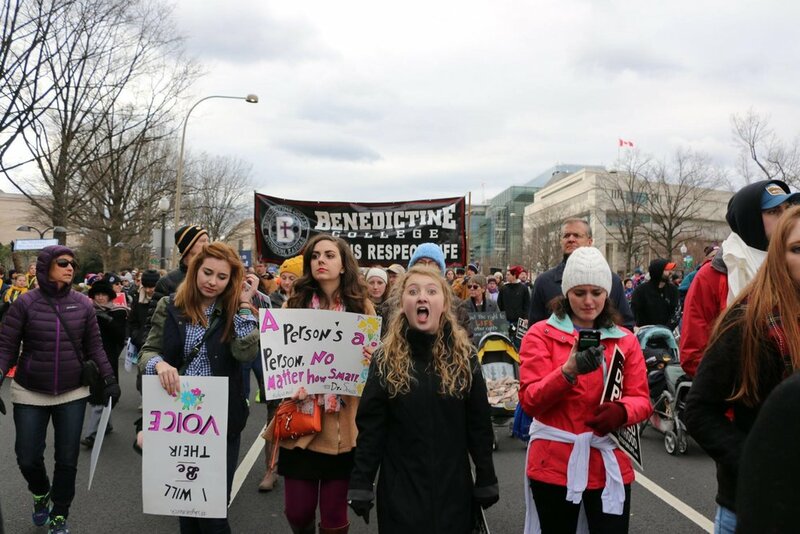 “That’s also another reason that made the March so hopeful, because on several occasions so many of the speakers mentioned from conception to natural death. They were talking about human life issues that are lifelong, not just unborn”, he said. Those coming back from the March not only can continue to pray for a respect for the dignity of all human life, but can put it in practice by helping with ministries such as Ravens Respect Life or by seeking out other ways to serve others in need, like the elderly or the homeless. In these ways, they can continue to be a witness to life back home or at school. 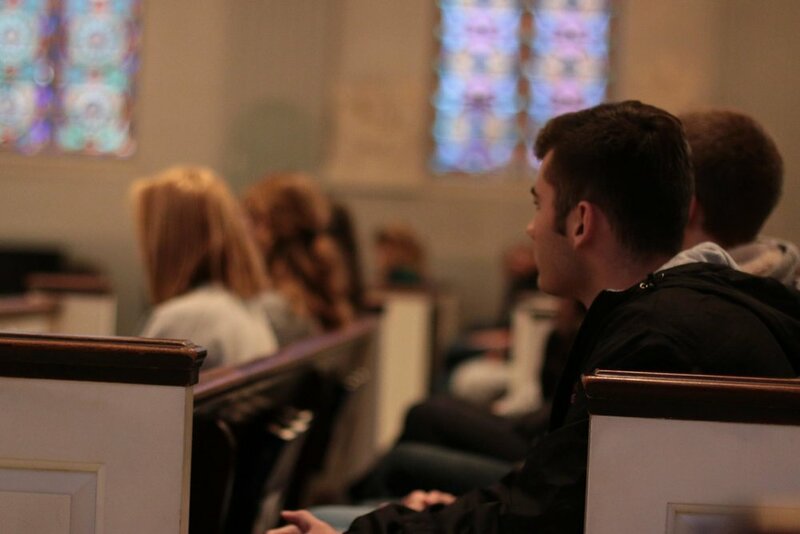 On the trip back from March for Life, students shared testimonies of their experiences and reactions during the last few days. Fr. Simon was in one of the buses and heard a story from one of the girls about her friend who was present at the March. The student spoke of a friend that is not Christian but who came to March for Life for the first time out of curiosity. The friend later called the student and told her that she had been deeply moved by the March and that it was “very clear that you guys are all for someone and against no one”. "It’s not about us versus the pro-choicers”, Fr. Simon concluded. “We’re here for the babies, we’re here for the mothers, we’re here for the pro-choicers. We’re for people. And most of all we’re for Jesus”. 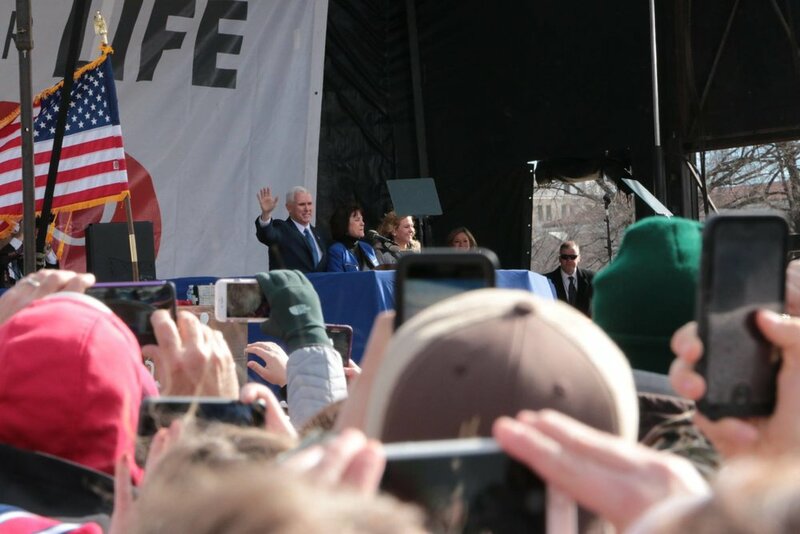 Whether it was through women who had had abortions and regretted them, the Vice-President of the United States, a non-Christian friend, or the Benedictine students and monks themselves, the 2017 March for Life was truly a witness to the nation not only of the dignity of life but of the love and mercy of Christ as well.